My energy is focused on advancing the Scaled Agile Framework with Dean Leffingwell, Colin ONeill, Alex Yakyma, Armond Mehrabian, and the many people I’ve met through client work and the Scaled Agile Academy. The growth of my knowledge and the evolution of my point of view are intertwined with the framework. 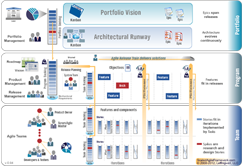 Services are offered through Fast Frontier and Scaled Agile Partners.